Kate Spade is a high-end American fashion brand specializing in women’s clothing, handbags, and jewelry. Here, you can shop from a variety of clothing and accessory options for both women and girls. With Big Apple Buddy’s personal shopping service, you can now buy direct from the Kate Spade online store anytime, anywhere. Kate Spade is particularly known for their handbags, which come in a variety of styles and sizes. The Madison Chaplin Drive Celeste Bag is made of Italian pebbled leather with 14-karat light gold plated hardware. This bag comes with an additional strap so that it can be worn either as a handheld or over-the-shoulder. The versatile size and color makes this bag able to complete any outfit and is big enough to carry all of your everyday items. The Chevron Alani Dress reflects the fun patterns that Kate Spade is known for and is a perfect dress for any occasion. With this unique pattern and triangle cut out in the back, this dress will surely stick out from the others in your closet. The simple colors in this dress also make it easy to match and style, so feel free to make it your own! Kate Spade also offers a wide selection of jewelry, including bracelets, necklaces, earrings, and more. Many of their necklaces are bright and bold pieces that will help you make a serious fashion statement. The Empire Pave Bib Necklace is made of semiprecious stones and pave crystals, all plated with shiny gold metal. 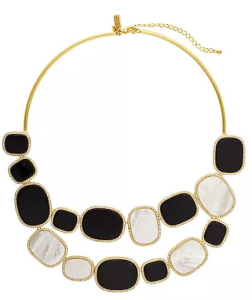 This chunky black and cream necklace will help dress up any outfit you’re wearing and adds some instant glamour. Unfortunately, the USA Kate Spade online store only offers international shipping to select countries. 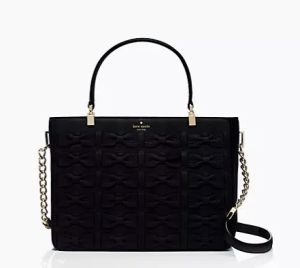 However, Big Apple Buddy, your personal shopper, can help you buy products direct from the official USA Kate Spade online store and ship them to your doorstep, no matter where you are in the world. If you would like to buy from the USA Kate Spade online store, simply let us know which items you would like to order (by filling out the form below) and we’ll get back to you with a free international shipping quote within 24 hours!